No Brake Lights - THE PORTAL HUB - Pinzgauers, Haflingers, Volvo 303s and more! I just replaced the turn signal switch on the Pinz and during my check of the lighting discovered that the brake lights don't work. All other lights are working fine. I jumped the connection at the master cylinder and still no lights. I cleaned all of the tail light grounds, and bulbs are okay. There is power at the red/black wire on the brake light switch but nothing getting to the rear. I looked over the wiring diagram for an in-line fuse but found nothing, but it wouldn't be the first time the circuit diagram didn't synch with the Pinz wiring. Is there something to check I before I do a full wire inspection? Been a long while since I did Pinz light work but I recall, and its been posted about before... check into your trailer wiring box under the back end. Double check the ground at the rear panel. I had to run a new wire. This was after cleaning the junction box wires and polishing the connections surfaces at the bulbs. The brake lights run through the yellow (upper) bulbs, correct? They work with the turn signals, and the lower bulbs (red) work with the headlight circuit. I looked at the upper bulbs to see if they are a dual filament type and they aren't. Also, I changed from a eight wire turn signal switch to a five wire model. The violet connector in the big connector block under the dash no longer a wire leading to it. Does this matter? I did check the wiring block underneath the rear end and everything looked connected and uncorroded. I detached and reattached the wires to make sure. 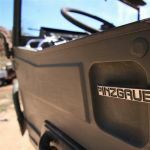 If your brake light circuit is using the yellow rear bulbs/lenses, then your Pinzgauer does not have the brake light conversion wiring done which is needed for the newer turn signal switches to work properly. The brake light conversion is easy but I'm on the road and don't have the instructions for doing it. From memory it involves disconnecting an unused wire on the headlight switch (pink on #58 maybe?) and jumpering it to the terminal on the brake light switch. Hopefully someone else will chime in with the full instructions. Thanks for the info. I'll stand-by until you get back or someone else comes up with the wiring scheme. I was losing my mind chasing down the wiring for a fault. As Paul said, you don't have the separate brake light kit, You'll need to get the rear lamp sockets from SAV that has a dual filament socket for the top bulb so that your brake and turn signal are independent of each other. Your electrical schematic is on the forum and is the Swiss model ( Swiss have circuit breakers, Austrian and all others use fuses, there are only 2 schematics ) Primary difference are the rear turn/brake lamps. Swiss are combine, Austrian are separate . THIS is where I am fuzzy, it has been 16 years since I owned or worked on a gas Pinz. IIRC in the rear lamps is a pink wire for the blackout lamps, move that wire to the higher amp filament post of the new socket, then under the dash, disconnect that wire from the ( again iirc) from the lighting switch ( it will be on the military blackout side of the switch which you don't use) and run a pigtail from it to brakelamp switch on the master cylinder . You must have the dual filament setup in the rear for this to work... Now we'll see how good my memory is. Last edited by David Dunn on Wed Sep 12, 2018 4:49 pm, edited 1 time in total. Vince, you need to retitle that subject to SWISS wiring schematic , since the Austrian spec'ed trucks are different. If the brake lights , turn signals and tail lights worked before, why do I need to get a new tail light? Or does the new turn signal wiring just not work with the old rear light set-up I now have? Your brake/turn lamps were "combined", meaning that a single filament handled double duty by way of switching in the turn signal assembly. Simply put, if your brake lamps are lite, and applied a turn indicator, internal switching in the turn assembly will allow that side to flash while the other is held solid in braking . Without that, you would always have brake lamps and no turn at the same time. With the conversion, brake and turn lamps do their own thing independently . From your description, the new turn assembly had fewer wires and those would have been the "combine" switching . Sorry for the delay but was out of town. Here are a few photos of the conversion sockets that Steyr used to have for the Pinzgauers to convert from single filament to dual so that you would have a true 3 function tail light (tail, brake and turn) with the tail and brake using a 5W/21W dual filament bulb. You still needed to re-purpose the pink wire in the tail lamp to add the seperate braking circuit. The pink wire was originally for the blackout light and likely is not connected to anything in the tail light. I'm still looking for the full instructions on this. SAV no longer is able to get the conversion sockets but I do have a set available from when I added alternate tail lights. I came across the original SAV instructions for converting to red brake lights. Hope this helps.